Footwear critics were able to experience a thrillingly comfortable ride in their SL Activs. Droves of owners applauded the boot’s tenaciously grippy outsole. Its overall support was hailed as one of a kind by numerous users. More than a dozen of testers spoke quite positively of the boot’s one-to-one fit. The SL Activ impressed several Scarpa loyalists with its insurmountable durability. Some wearers fell in love with this boot for its ability to keep water walled off despite not having proper waterproofing. Professional reviewers gave the Scarpa SL Activ aces for featuring a kind of lacing system that is easy to tighten and configure. This backpacking gear made a small number of consumers extremely satisfied with its amazing flexibility. A few owners got very disappointed with the Scarpa SL Activ’s lengthy break-in time. Expert reviewers threw shade on the boot for being quite heavy. The asking price of the SL Activ was sky high, based on a couple of written reviews. Plenty of product testers would not recommend using it in hot conditions. In terms of comfort, support, and fit, it appears Scarpa engineers have really knocked it out of the park with the SL Activ. They have also crafted something greatly captivating in this footgear on the traction front. Having said that, they should’ve taken more time to make its lumbering weight far lighter and its long break-in period a whole lot shorter. All in all, wearers would have to look past the Scarpa SL Activ’s meager list of misfires to fully experience every good thing it has on offer. [T]hese are going to last us many many years so it's well worth considering three or four season boot like this Scarpa SL Active. We’re not massive fans of 3-4 season boots for non-winter use here, stiff soles make more sense when you’re kicking into snow or wearing crampons, rather than on hot summer mountain days, but that’s personal preference and some people will choose to use them all year round. A solid performance from the standard-bearer for the 3-4 season category, but there’s no women’s version. Yes, these are pricey boots, but build quality, performance and looks are all first rate and for anyone who is serious about their winter walking the SL Activ has to be worth checking out. The Scarpa SL Activ is the revamped version of the SL M3. Among the key changes in this redesigned version is the addition of a heavy-duty rubber rand at the base of the upper which its former self lacked. This updated model is constructed with a technology called Activ Fit. Absent in the previous build, this technology gives the boot improved stability and a more streamlined fit. Scarpa engineers gave this footgear a semi-stiff midsole. This kind of build quality puts the SL Activ under the B1 category which makes the boot compatible with C1 – strap-on crampons. 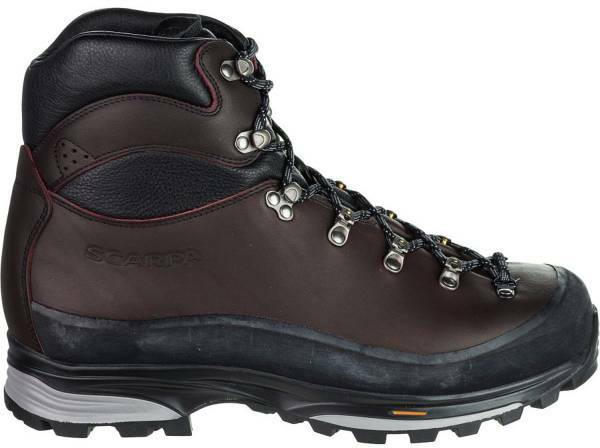 Scarpa’s hiking boot, the SL Activ, is crafted specifically for male backpackers. Its fairly true-to-size fit is intended for wearers with regular feet. It comes in a range of half and full sizes. It is built on the BD last, improving the user’s foothold and giving the boot the right amount of volume for more cushioning. The gear’s speed lacing system provides a custom lockdown. The Scarpa SL Activ has a dual-density PU midsole for terrain stability and comfort underfoot. It comes with a dynamic TPU shank which gives additional medial support. Right on top of this stabilizing component is the Activ Plus footbed. It is made of memory foam, granting familiar comfort over time. Covering the foot safe from the elements is the SL Activ’s HS12 Sherpa leather upper, complete with a fabric liner courtesy of 37.5. Its sturdy thickness (at 2.7 millimeters) offers support and a level of scuff resistance. Its full-on rubber rand further bolsters the leather hiking boot’s defenses against abrasions. Completing the upper’s equation is the boot’s quick lacing system. It uses synthetic laces and combination eyelets made of metal.